Source of VOCs: Volatile Organic Chemicals (VOCs) are found in a wide range of commercial, industrial, and consumer products, including degreasers, solvents, paints, inks and dyes, gasoline, and some pesticides. VOC contamination of ground water often occurs where the chemical has been improperly poured onto the ground, leaking drums, landfills, industrial sites and chemical spills. Water supplies can be contaminated when VOCs leach into groundwater. VOC contamination usually occurs in private wells. Health Effects of VOCs: Health risks are dependent on a variety of factors including the type of chemical contaminant, the concentration of the chemical in the water, sensitivity of the individual consuming the water and period of exposure (days, months, years) to the contaminated water supply. Many VOCs are suspected carcinogens. How to Remove VOCs: In most cases a whole-house activated carbon filter is the best Available Technology (BAT) for removal of VOCs. Another option is a WECO reverse osmosis filtration system. This complete 5-stage water purification system removes tastes and odors along with suspended particles like sand and grit, chlorine, chloramine, carcinogenic chemicals, pesticides, solvents, and heavy metals like lead, cadmium, copper and arsenic. WECO whole-house and commercial filtration systems are also available. Source of Organic Chemicals: Organic chemicals contaminants include pesticides and herbicides (synthetic organic chemicals), disinfection by-products (DBPs), polychlorinated biphenyls (PCBs), industrial chemicals and pharmaceuticals. Water supplies can contain organic pollutants through contamination from farm run-off, landfills, factories, spills and improper disposal. Health Effects of Organic Chemicals: Health risks are dependent on a variety of factors including the type of chemical contaminant, the concentration of the chemical in the water, sensitivity of the individual consuming the water and period of exposure (days, months, years) to the contaminated water supply. Many organic compounds are suspected carcinogens. How to Remove Organic Chemicals: In most cases a whole-house activated carbon filter is the best Available Technology (BAT) for removal of organic chemicals. Another option is a WECO reverse osmosis filtration system. This complete 5-stage water purification system removes tastes and odors along with suspended particles like sand and grit, chlorine, chloramine, carcinogenic chemicals, pesticides, solvents, and heavy metals like lead, cadmium, copper and arsenic. WECO whole-house and commercial filtration systems are also available. Tannins come from decomposed natural organic material. When water passes through peaty soil and decaying vegetation it picks up natural tannins, also known as fulvic and humic acids. Tannins can cause well water to have a light yellow to tea-like color. Tannins may cause yellow staining in laundry. Tannins can cause a tart aftertaste and earthy odor to water. Health Effects of Tannins: Tannins are not associated with health risks at the levels found in drinking water. Tannins creates aesthetic problems with taste, odors and in the laundry. How to Remove Tannins: A WECO Point Of Entry (POE) activated carbon backwashing filter will remove tannins and correct taste and odor problems. Source of Viruses: Viruses are microscopic pathogens. There are over 100 different viruses that can affect human health. Outbreaks occur when water sources are contaminated with human or animal feces. Water run-off from land and faulty septic systems are main routes of contamination of drinking water. Water sources include lakes, streams and wells. Health Effects of Viruses: Virus-associated health issues include polio, meningitis, gastroenteritis, upper respiratory troubles and hepatitis. How to Remove Viruses: A Polaris Scientific Ultraviolet Disinfection System is recommended to counteract virus contamination. The Polaris system will kill the organisms as water passes through the UV radiation, rendering the water safe to consume. The Polaris UV system can be used on residential and commercial applications. Source of Taste Problems: Taste problems in drinking water can be caused by a variety of substances. Chlorine and chloramine disinfectants are considered distasteful by most people. The natural mineral make-up of your water source can also make the water taste bitter or even salty. Natural organics from vegetation or algae blooms in a reservoir can seasonally affect the taste of your drinking water. Health Effects of Taste Problems: Taste problems in drinking water are usually aesthetic and don’t pose a direct health issue. Many people don’t want to drink water with a bad taste. This is especially true when there are children in the home and for coffee shops, hotels and restaurants. High iron can also cause taste issues along with laundry and sink staining. How to Remove Taste Problems: In most cases a whole-house activated carbon filter is the best Available Technology (BAT) for removal of taste-causing substances. A specialty WECO backwashing filter may be needed, depending on the cause of the taste issue. Another option is a WECO reverse osmosis filtration system. This complete 5-stage water purification system removes tastes and odors along with suspended particles like sand and grit, chlorine, chloramine, carcinogenic chemicals, pesticides, solvents, and heavy metals like lead, cadmium, copper and arsenic. WECO whole-house and commercial filtration systems are also available. Source of Nitrate: Nitrate (NO3) is naturally occurring in nature and is formed during decomposition of proteins, manure wastes, urine, and from other nitrogen-containing compounds. Nitrate can enter into groundwater from rain and melting snow. In some cases, nitrogen fertilizer can contribute to Nitrate in groundwater. Nitrate can be found in well and municipal water supplies. Shallow or improperly located wells are more susceptible to nitrate problems. Health Effects of Nitrate: Nitrate in drinking water poses a special risk to infants under six months of age. When infants are given formula made with water high in nitrate, a condition called "blue baby syndrome" (methemoglobinemia) can occur. The syndrome prevents the infant's blood from carrying oxygen. The baby's skin turns a bluish color. Death can result if not treated promptly. For many adults, limiting nitrate intake is an important health goal. The US Environmental Protection Agency has set a maximum contaminant level goal (MCLG) for nitrate at 10 mg/L or 10 ppm. EPA has set an enforceable regulation for nitrate, called a maximum contaminant level (MCL), at 10 mg/L or 10 ppm for all public water supplies. How to Remove Nitrate: A reverse osmosis filtration system will reduce nitrate in drinking water by more than 98%. It is the ideal filter system for under counter installations in the home or office. 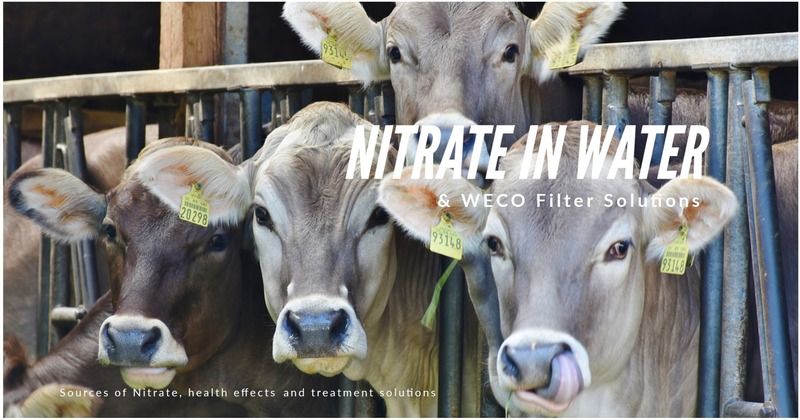 A WECO nitrate-removing Point Of Entry (POE) ion-exchange filtration system is an option for whole house and commercial applications. Contact us and we will help you choose the right WECO system for your application. Source of Mercury: Mercury is a naturally occurring element found in trace amounts in the Erath’s crust. Mercury is used in dental preparations, thermometers, fluorescent lamps, and pharmaceuticals. Mercury has also been used as a fungicide and as part of industrial processes. Mercury can leach into water supplies from old dump sites, factories and improper disposal. Health Effects of Mercury: Exposure to high levels can result in brain damage, kidney failure, and vision. Pregnant women especially should avoid exposure to mercury. Chronic, low level exposure is still being investigated. How to Remove Mercury: A WECO reverse osmosis system will remove Mercury and other harmful heavy metals like copper and lead. Reverse osmosis filtration will also remove taste and odor problems, pesticides and organic chemicals like VOCs. Source of Water Hardness: The definition of water hardness is the amount of dissolved calcium and magnesium in the water. Hard water is high in dissolved minerals, both calcium and/or magnesium. As water moves through soil and rock it dissolves naturally-occurring water hardness minerals and carries them into the groundwater supply. Well and municipal water supplies can have hard water. Health Effects of Water Hardness: Hard water is not associated with health concerns. However, hard water requires more soap and synthetic detergents for home laundry and washing, and contributes to scaling in boilers and industrial equipment. When hard water is heated, it produces the mineral deposits on glasses and dishes. Industrial-sized water boilers and home water heaters become coated with mineral scale, reducing efficiency and causing leaks. Hard water scale can accumulate on the inside of appliances, such as dishwashers, and pipes. As scale builds up, water flow is impeded, and causing appliance parts and pipes to be replaced more often. How to Remove Water Hardness: A WECO water softener will remove calcium and magnesium from all of the water entering the home or business. A WECO reverse osmosis filtration system installed after a water softener will remove all types of contamination that cause taste and odor problems (chlorine and hydrogen sulfide), heavy metal, pesticides and solvents. Source of Selenium: Selenium is a natural mineral found in the earth’s crust. 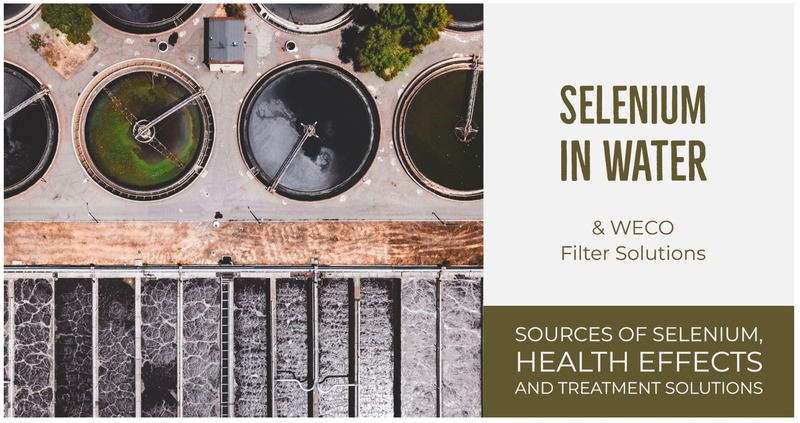 Selenium also comes from natural run-off, industrial wastewater from copper and lead refineries, municipal wastewater and leaching from hazardous waste disposal sites. Mining operations can contaminate surface and groundwater with selenium. Health Effects of Selenium: Being exposed to high levels of selenium for a long time (in drinking water) can cause hair loss, brittle nails, and neurological problems. 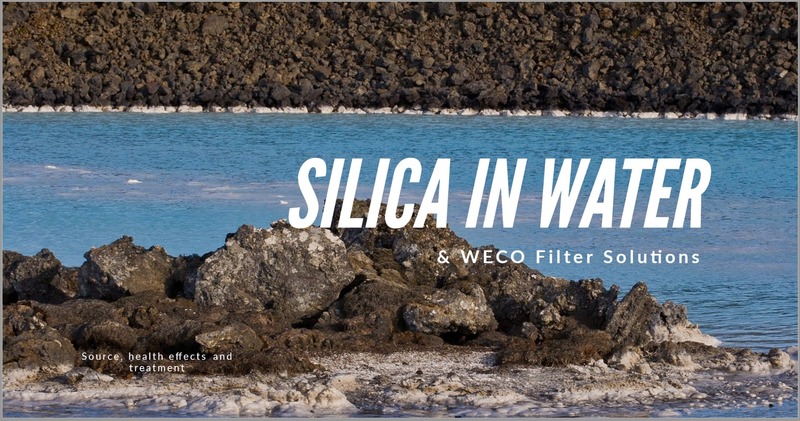 How to Remove Selenium: A WECO activated alumina backwashing filter will remove selenium from all the water entering the home or commercial facility. 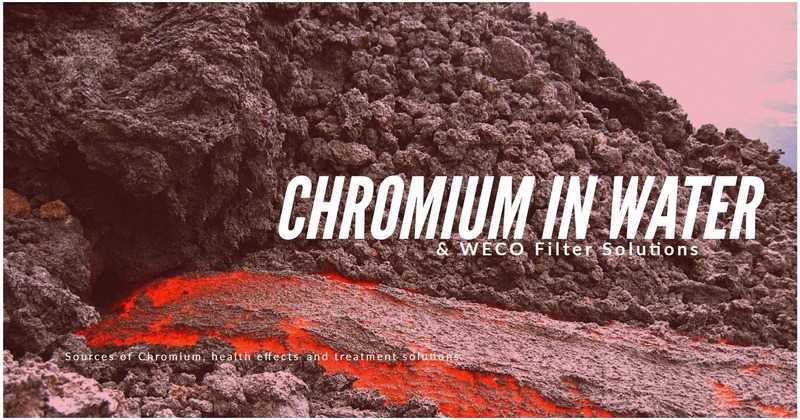 WECO also offers a point of entry (POE) filter using anion-exchange resin in the chloride for. The system is regenerated using sodium or potassium chloride. For residential drinking water purification, a WECO reverse osmosis system is recommended. We recommend consulting with a WECO technical support specialist to determine which filtration system is right for your application. Source of Copper: Copper is a metal that occurs naturally in rock formations and soil. It is used to make electrical wiring, pipes and many other common products. The primary route of water contamination is leaching from copper pipes in the homes, institutions and commercial operations. Health Effects of Copper: High ingestion of copper can cause adverse health effects, such as nausea, vomiting, diarrhea and stomach cramps. It has also been linked to liver damage and kidney disease. Young children are especially susceptible to copper poisoning. US EPA national primary drinking water regulations set a legally enforceable maximum contaminant level (MCL) of 1.3 mg/L concentration of copper in public water systems. How to Remove Copper: A WECO reverse osmosis system will remove copper and other harmful heavy metals like lead and arsenic. Reverse osmosis also removed taste and odor problems, pesticides and organic chemicals like VOCs. A WECO whole house filter system with Katalox Light filter media may also be used to control copper problems that are due to the source water. Contact WECO technical support for help selecting the right filtration system for your application.